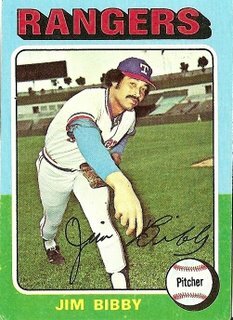 Jim Bibby began the 1975 campaign on the Texas Rangers but was traded to Cleveland in mid-season along with Jackie Brown, Rick Waits, and $100,000 for Gaylord Perry. A few months later, Cleveland made another deal, shipping a power-hitting part-time outfielder to the New York Yankees for Pat Dobson. What I’m saying–and my hands are shaking as I type this–is that between those two deals, from June 13, 1975, to November 22, 1975, Jim Bibby and Oscar Gamble were teammates. I am incapable of fully expressing my emotions regarding this stunning discovery. I can only point out that in this picture, a young Jim Bibby’s already sizable afro appears to be annexing a treetop poking up over the top of the stadium in the background. As evidenced by the calm, confident, slightly mirthful expression on his face, Bibby was aware that he was just getting started, that he was deep in the groove of the process of creating one of the most wondrous monuments of his time. Decades later, grown men on high ledges would be coaxed back into resuming their disappointing existences by the seemingly accidental childhood recollection of Jim Bibby’s glorious afro, the embers of awe and glee glowing once more just in the nick of time. While we were in our 20s, some friends and I sometimes passed the time waiting for our lives to begin by drinking beer and inventing entire discographies and rehab-addled histories of various versions of the rock band we would never start, or even really consider starting, none of us with any initiative or musical talent. One of the band names we came up with was Bigger Than Bibby. I suppose we wanted our narrowing worlds to be more, I don’t know, mythical or something, as they seemed when as children we held a certain piece of cardboard, our mouths clogged with sugary gum, and gazed for the first time upon what Jim Bibby hath wrought. I think we also were drawn to the impossibility imbedded in the band name–on a certain level, a supremely important or perhaps completely unimportant level that I am spending my life trying and failing to define, there was nothing bigger than Bibby. I must contend with the claim that Jim Bibby and Oscar Gamble had the largest “fro’s” of the era. Also, I believe Bryan Clark, spot relief pitcher for the ’82 Seattle Mariners, would have something to say about the large afro debate. The facial expression on his card also begs to be lampooned in some fashion. This was one of my favorites from childhood. Here’s the only link I could find on the web to cherished classic. 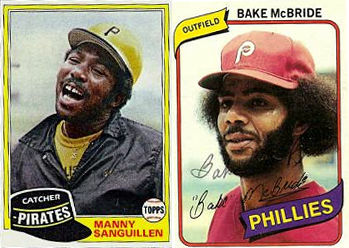 just in case you weren’t familiar with the classic Shake and Bake McBride cards of the late 70’s, I’ve found this link. The other card in the image, that of Many Sunguillen, also begs to be mocked. Kevin S.: Thanks for those links. Man oh man, you might have a case there with Bake McBride. I swear that Bibby at one time equalled the massive size of Bake’s afro, I just can’t find a card in my collection to prove it. Unfortunately, I don’t have a Bake McBride card in my own collection (for some reason I have very few Phillies), but I do have a 1981 Phillie card for the huge-afroed Nino Espinoza, which I’ll have to comment on some day when I feel capable of tackling such a daunting subject.